HUGH JACKMAN'S New Futuristic Japanese Robot Movie 'REAL STEEL' Has A Trailer, Fakku! 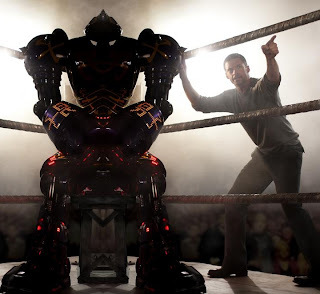 Real Steel is the futuristic tale about a boxer who builds a robot that competes in underground robot fights. But the movie is supposed to be compelling too? Shawn Levy directs Hugh Jackman as a washed-up boxer who coaches giant mechanical boxers. This movie wants to be more than a derby of cyborg carnage, it wants to be emotional because there is a father son relationship on the balance ..Chikusho! The movie hits theaters on the 8th October Hit the jump and decide for yourselves. I'm reading: HUGH JACKMAN'S New Futuristic Japanese Robot Movie 'REAL STEEL' Has A Trailer, Fakku!Tweet this!